Shadowhunters is more than halfway filming on its pilot episode, and Day 7 did not disappoint with the behind-the-scenes pics. 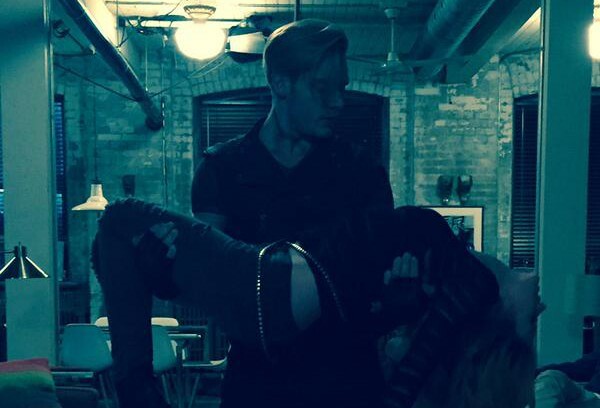 Executive producer McG shared this incredible shot of Jace (Dominic Sherwood) carrying what looks to be an unconscious Clary (Katherine McNamara) in her apartment. Could this be after the Ravener attack? The photo gives us a nice look at Clary’s apartment. And for some reason I cannot stop staring at Dom’s hair. So nice. Showrunner Ed Decter shared this adorable photo of McG carrying Katherine McNamara, which just may be the cutest shot involving a photobomb by the Toronto trolley. And look at McG photobombing Kat and Maxim Roy. Let’s see what excitement Day 8 brings! Shaodowhunters will continue filming its first season through October in Toronto. The show will premiere in early 2016 on ABC Family. McG seems to be taking a playful approach to everything. I like that in a director. What about the two legs visible on the right and side of the picture? They look like of a person in a seated and quite relaxed position. Those legs belong to Ed Decter according to Peter (@TatoBins)! Yeah just a behind the scenes not from during a take. Probably practicing carrying and being limp! Do you think there will be any possibilities that at least one TV production can be interested in buying the show once it airs in the US? Usually that’s the way it works. When I saw this post I chocked. The only thing I managed to say was: BY THE ANGEL!!!!!!!!! Woow wait Clary lives in New York in the book, right!? Why are they filming in Toronto? I’m pretty sure it’s still set in NY, they’re just filming at Toronto locations- the film also shot in Canada. AWWWWW I LOVE IT! I can’t wait for the episode in 2016 although i wish i didn’t have to wait!